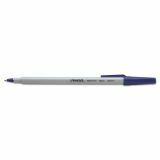 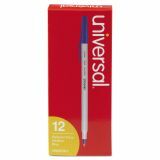 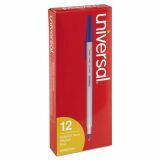 Stick Ballpoint Pen, Medium 1mm, Blue Ink, Gray Barrel, Dozen - The Universal Stick Ballpoint Pen is a simple lightweight pen that stays reliable from start to finish. The economy ballpoint is a durable pen with a value price. 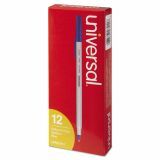 Ballpoint ink is oil-based and dries quickly to protect documents.